Bullies can make you feel powerless, but read on for some strategies you can employ to beat them. London South Bank University professor of healthcare and workforce modelling Alison Leary describes bullying as: ‘unwanted behaviour – when people are put at a disadvantage, feel intimidated and unable to speak up'. 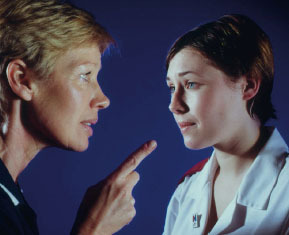 In a nursing environment, bullying behaviour can be overt, such as behaving aggressively towards a colleague or undermining someone’s professional ability. Alternatively, it can be covert, such as excluding people from meetings or not providing the necessary information to enable people to do their job effectively. Talk to someone who you trust, such as a work colleague, a workplace counsellor, RCN representative or a friend. Keep a diary of incidents when you have felt bullied to help clarify what you are experiencing and to identify patterns and triggers of bullying behaviour. Approach the person you are having difficulties with. Be factual, but also explain how their behaviour makes you feel. If this approach does not work or is inappropriate, meet with your manager or human resources department and ask them to talk to the individual about their behaviour. Look at your workplace policy, available on the organisation’s intranet, to find out what is defined as unacceptable behaviour and what steps staff should take to address it. Nursing is a profession ‘where often people don’t see achievement as acceptable,’ says Professor Leary. This attitude brings out people’s insecurities and can lead to bullying, she suggests. Bullying can have serious consequences not only for people’s health and wellbeing, but for organisations and for patient care, as was revealed in the Francis Report on the failings at the Mid Staffordshire NHS Foundation Trust. The first step to dealing with bullying is to talk to someone you trust. ‘You may question whether you are being bullied. But if you are feeling distressed don’t let the wound fester,’ says Ms Sunley. Keeping a diary of incidents when you have felt bullied can help to clarify what you are experiencing and identify patterns of behaviour. If possible, directly approach the person who you are having difficulties with. Consider inviting a third party, such as a trusted colleague, to discuss the problems. Use the discussion to explain how the individual’s behaviour makes you feel – sometimes people are unaware of the effects of their behaviour. If this approach does not work or is inappropriate, ask your line manager to talk to the person who is bullying you. If the line manager is the problem, talk to another manager, or your human resources department. You should check your workplace policy for guidance. Some cases may lead to a formal complaint, but taking early action will nip many in the bud. ‘Bullying is common, and it is insidious,’ says Professor Leary. ‘But it should be addressed to ensure people work in a fair and just environment’.